Marilyn Manson and Alice Cooper kicked off their ‘Masters of Madness’ tour on June 1 in Albuquerque, N.M. The horror show featured full sets from both shock rock icons, but the crowd was treated to a unique duet as the pair shared the stage for Alice Cooper’s classic anthem ‘I’m Eighteen’. During Marilyn Manson’s 2012 tour with Rob Zombie, there was some well-documented tension between the two artists, but Manson and Cooper are getting along swimmingly so far. The duo walked the Revolver Golden Gods Black Carpet together, bouncing jokes off each other, and yet another sign of the duo’s friendship was showcased as Manson appeared onstage to sing ‘I’m Eighteen’ with Alice Cooper. 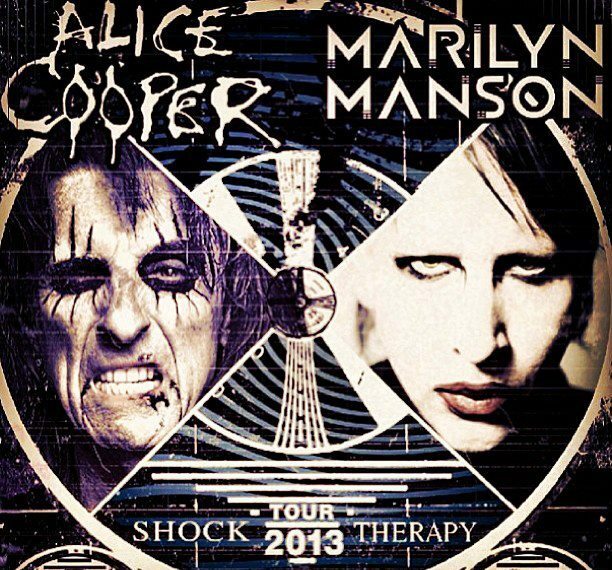 Manson appeared onstage to surprise the New Mexico crowd during the second verse of ‘I’m Eighteen,’ which Alice Cooper invited the ‘Antichrist Superstar’ to come out and sing. Fan-filmed footage of ‘I’m Eighteen’ documents the audience’s electric reaction to the surprise guest appearance, as female guitar phenom Orianthi shreds along with the rest of Cooper’s band. Check out the footage of Cooper and Manson performing together below.